Maybe you didn't want to spend $429 on a concert ticket, or shell out $125 to sleep outside in a field of drunk people. Maybe you aren't rich (or bold?) enough to drop $9,500 on a "safari camping" pass, or however many billions it costs for an Airbnb on an alarmingly hydrated golf course. Maybe you dislike extreme heat or white people in headdresses, dashikis, henna, bindis, war paint, flowy shirts, embroidery, cut-off shorts that look like a wild animal clawed a pair of denim underwear, or any combination of the above. Or maybe you're just too old (any age), too tired (you have normal energy levels) and too basic (you enjoy having 24-hour access to drinking water) to go to Coachella this year. Well we have some good news. You don't have to. 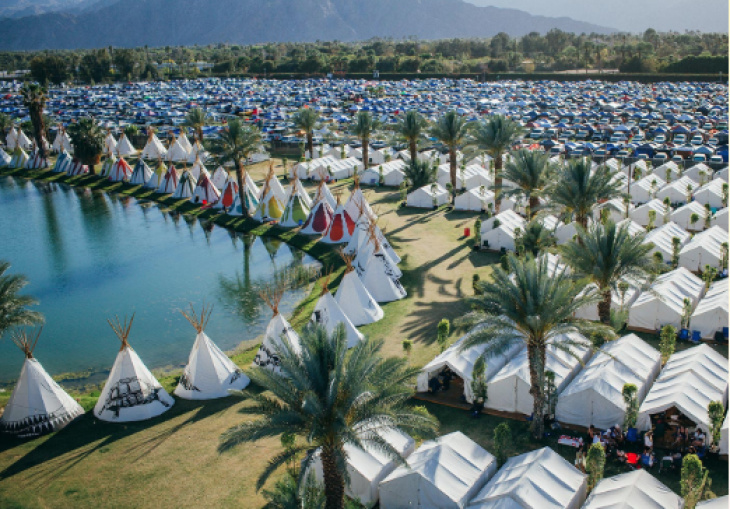 We've assembled some instructions on how to live your best Coachella life without leaving Los Angeles. We promise it will involve a lot less driving and a lot more personal space. At the very least, it will cost you less than $9,500. Wake up in a not-a-tent and enjoy the cool not-110-degree breeze. Welcome home! You never left. Express gratitude for the simple pleasures of not driving for four-plus hours this morning, and not having to wait in line for a porta potty. It's 2019 and you will be using a toilet that flushes today! It's time to put on your Coachella-best. Head to your closet and pick out something that the Olsen twins might have worn in 2005 when "boho" was considered cool. You'll know you're doing things right if you look like you just got shipwrecked. Anything with gauzy fabric, floral prints, and/or fringe is ideal. Wide-brimmed hats are mandatory. Now you're going to want to envision what someone who herds sheep might wear and copy that to the best of your ability. When in doubt, put a feather on it. Grab some cooking oil from your kitchen and rub it in your hair. You'll want to look like you haven't showered in at least three days. If you're out of olive oil, try a ripe avocado or melted butter. Add some cornstarch to achieve an appropriate texture. For best skin results, turn off your air conditioning and begin drinking beer and beer only until your face loses all of its natural moisture. Do not rinse and repeat. You look great! Netflix and chill with you, yourself, and your bed because Beyonce made a documentary about being Beyonce at last year's Coachella and it's streaming on the internet. Once you've laughed and cried and decided that the world is full of poetry, it's time to get topical. Welcome to the Coachella live stream. It's free and a freakishly tall man can't stand in front of you just before your favorite artist starts playing. If that's not cutting it, Donald Glover and Rihanna made a movie that will be released on Amazon Prime after Childish Gambino's set. It's called "Guava Island" and the trailer doesn't include many clues beyond that. It will probably be good though, because....Donald Glover and Rihanna. Wow, the transformative cultural experience you just had made you super hungry. Coachella's PR team says the festival's food options include some of the best restaurants in L.A. But you're already in L.A., so we invite you to sample these culinary delights without waiting in long lines with people who are probably microdosing for the first time. You can order plenty of festival-adjacent treats from the comfort of your home. Start with a "flower crown pie hole," which is essentially a bunch of tiny pies covered in edible flowers, available through Uber Eats and advertised as a good post-festival hangover cure. The Pie Hole's PR team promises it will be "insta-worthy." This year's Coachella food lineup includes a Pete's Coffee bus and plenty of cold brew on tap. The PR team says the coffee will be as good as the music...and also that it will be "instagram-worthy." You can probably order a cold brew on an app, right? Next, get an egg sandwich from Konbi, ice cream from Salt & Straw, and a "smashburger" from Love Hour. Surely these will also be insta-worthy. Roy Choi will have a "culinary installation" at the festival called "KogiTown." Instead of taking a trip to KogiTown, we suggest ordering a Chego bowl from Postmates. Speaking of Postmates, this year Coachella attendees will be able to order their food and drinks ahead of time via the app and pick up said food somewhere on the festival grounds. But that means nothing to you, because for the duration of the festival, Postmates is offering three free deliveries in L.A. with promo code: COACHELLA. It's almost like they don't want you to go. Fun fact, last year there was a $100 hot dog. This year, level up at home by buying 100 hot dogs for the same low, low price. The most important thing about going to Coachella is showing everyone that you're having the most amazing time at Coachella. The more jealousy you inspire, the better. Now that you've watched the content, eaten the food and styled yourself appropriately, it's time to put it on the 'gram. Go outside, in high sun, find a green-yet-dusty patch of land. Lay down on it without a blanket, and stream the festival playlist. For extra authenticity, do it again at night in a tent. Remember to try to look like you're the happiest you've ever been, but also like you don't really care that much. And don't forget, you are #blessed.